The Electrical Depot.com/blog - "Electrical Connectors and Much More"
Purchase in our catalog here. Jan-Feb/2019 In our ongoing effort to bring our customers the latest most useful products, here are our latest additions. Looking at our home page you will notice two new categories at the bottom right of the page. An after-market add on, the USB Power and service ports for phones, tablets and other mobile devices are gre for 12V and 24V systems. With the proliferation of USB powered and connected devices, these USB power point and connecting devices are just the thing to add more capability to your current car, boat, RV or what have you. Designed to fit in current socket styles, installation will be a breeze. The round options work well where you don’t have a pre-made socket. Just drill a hole! Please see the website for additional information and pricing. General Technologies Corp – Engine Ignition Analyzers. Manufacturers of diagnostic and test equipment for use in all types of vehicles. These product range includes: digital tachometers, laser tachometers, ignition testers and analyzers, DC wiring faultfinders, multimeters, high and low current clamp meters, cordless circuit testers, infrared thermometers, oxygen sensor testers and simulators. 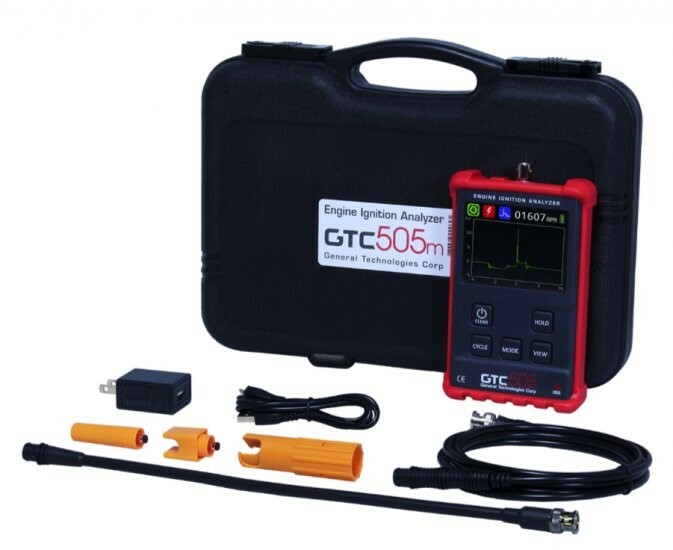 The GTC505 Engine Ignition Analyzer is a handheld instrument designed from the ground up for the diagnosis and performance measurement of all types of spark ignition systems, from conventional to the newest Coil on Plug- in use. This hand held device is powered by a rechargeable lithium battery, which provides up to 8 hours of battery life and uses a fast response 3.5″ color TFT display with a bright backlight and wide viewing angle. The CM100 low current clamp meter is designed to accurately measure current, current leaks (parasitic draws down to 1mA) and electrical loads from 1mA to 100 amp AC/DC and voltages from 0 to 600 AC/DC. The CM100 low current clamp meter is designed to accurately measure current, current leaks (parasitic draws down to 1mA) and electrical loads from 1mA to 100 amp AC/DC and voltages from 0 to 600 AC/DC. GTC8027 Professional Automotive Digital Multimeter General Technologies Corp.multiMeter. Professional Automotive Digital Multimeter Quick and easy to use. The smaller and ergonomic profile compared with previous models makes handling and operation easier and more convenient Single knob selects function. For questions on any of our products: info@theelectricaldepot.com expect a quick response. These specially designed, plastic encapsulated connectors provide quick and reliable access to the fuse block circuits for testing voltages, currents and for tapping into the power line without damaging the fuse block or wiring in the vehicle.Easy to use. Save time trouble shooting. Quickly move from circuit to circuit. I started wiring at 16 on old cars I owned. The wiring was a mess on many of them and I had to figure out how to get them running. Doing wiring repairs I would go to the auto parts store and pick up whatever connectors were inexpensive (ie: cheap). After some time and trial and error, I learned a valuable lesson about weatherproof connector quality. Why Does Using The Right Weatherproof Connector Matter? As I said; when I started out using crimp connectors I would use just anything that was cheap and that I had the tools for, usually pliers. I would sometimes spend days figuring out the problem and then repair the wiring with the cheap connectors and tools. A few months later especially after going through a rough Colorado winter, I found I had shorts or dead wires in the system and would have to go back over everything again to re-fix the issue. Often times, the issue was at the connector I had used for the repair. The inexpensive crimp connector would have consistently allowed moisture and dirt into the connector and the result would be corrosion and a failed connection. After having this come up several times, I got to thinking there has to be a better way. After checking around with more experienced automotive technicians, I found there was a big difference in the quality of electrical connectors for low voltage, (basically 12 or 24 volts) wiring connectors. Also, there were connectors available that were water / Weatherproof. Of course, they were there all the time I just didn’t think I needed them. My problem was that in using inexpensive, poorly made connectors or not using the correct connector for the job, I wasn’t thinking long term. I hadn’t given much thought to corrosion and how it would affect the wiring system over time. Usually a surprisingly short time. Also such as in the case of trailer wiring, there were areas where the wiring was exposed to dirt and water. Not good for wiring or connectors! If you ever had to fix trailer wiring in the middle of the night in a snowstorm in the mountains because you had no lights, you know what I mean. Most of the inexpensive connectors made poor connections and had very little in the way of insulation or a way to keep dirt and moisture out. After a short time, water and dirt would get inside and corrosion would result, creating a dead connection or short. Even if you wrap them in electrical tape, as I often did, the tape would come apart not holding up against the weather and eventually the connection would fail. Failure to choose connectors that weren’t meant to be exposed to the elements is asking for trouble. Solution: Choosing The Right Connector. There are many connector types and brands to choose from. The first thing to consider is where will the connector be used? Will it be exposed to the elements, in a dirty or greasy environment, How about heat? Some of the connectors pictured in the first two illustrations would be fine in a dry environment away for contaminants, but to have a quality long lasting weather, grease, dirt proof connection, I would recommend using something like the connectors in the third picture. My favorite for general use, NSPA Krimpa seal ® heat shrink waterproof, weatherproof connectors, shown below. These wire connectors are either crimped on the wire or the connector itself is closed on the wire (scotchlok) Great for general purpose in dry conditions where corrosion is not a consideration. NSPS Krimpa-seal Waterproof Connectors For a weatherproof seal just Crimp the terminal, then apply heat. These are very special connectors and in my view are the best for strong reliable weatherproof connections. They have several great features. (see photos) They are both crimped and soldered. In other words, you insert the wires, crimp them with a good crimp tool, then heat them to melt the solder and heat shrink the insulation around them. At the same time, adhesive seals the ends making a strong bond that will not pull apart. This will not allow water or dirt into the connection. That results in a dependable weatherproof connection that will last. Oh yes, there is another great feature. There is a clear window in the connector insulation. You can see that the wires are properly inserted, crimped and solder sealed. A window allows certainty wires are in the connector before you actually crimp or heat seal the connection. A truly environmentally sealed connector. At The Electrical Depot we proudly provide customers quality products at competitive prices. Below are some of our top selling products that customers continuously purchase. Deutsch DT connectors remain at the top of list for connectors sold on a regular basis. Deutsch provides a variety of connector options that allow our customers to find a solution to all of their electrical connection requirements. DEUTSCH CONNECTORS are for use in electrical systems where moisture, salt spray, dirt or dust could potentially damage electrical connections or systems. TheElectricalDepot.com offers custom made Deutsch assortment kits. Simply email us at Info@TheElectricalDepot.com; and let us know what kind of connectors and quantities you would like in a kit, i.e. DT, DTM, DTP, different combinations or an assortment of terminals and removal tools. Once your custom kit is built we will send you a final quote for approval. NSPA has been part of our business from day one. We supply NSPA waterproof heat shrink connectors to customers everyday. Manufactured and designed in the USA, these connectors stand up to the toughest conditions thrown their way. After purchasing connectors, deciding on the proper crimp tool can be a difficult task. Prices can vary, as well as the quality. For Deutsch connectors we recommend two different options (both of which we’ve provided tutorials on how to use them, please view previous blog posts). For a high quality crimp tool, that will likely last you a life time, Deutsch offers an HDT-4800 crimp tool. For smaller wire gauge crimping, the Paladin 1460 is your tool. When crimping terminals, Pressmaster (KSA-0760) offers one of the best tools for sale. 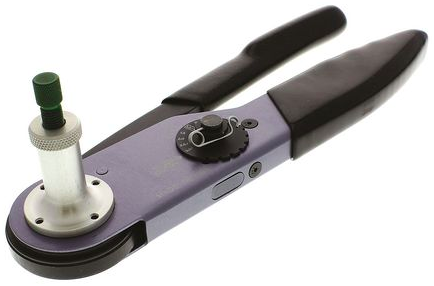 This tool is ratcheted so you will never “over-crimp” your terminal. 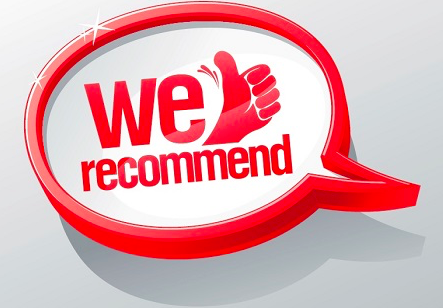 We thank you for shopping at www.TheElectricalDepot.com, if there is anything we can help you with please feel free to call or email with your questions. We are here to help with all your technical questions regarding any products we sell on our site, you can count on quality service every time! Thank you again for reading our blog! The Greenlee PA1461 crimp tool is an economic tool that is used for crimping terminals between 20awg and 12awg. Crimp 4 indentations onto closed-barrel d-subminiature contacts for various computer & electrical connections. Applications include: printer connectors, joystick connectors, video connectors, analog/digital audio conenctors, electrical connectors and electronic connectors. Full-cycle ratchet mechanism ensures proper terminations. Auto-release when crimp cycle is complete. The Deutsch HDT-48-00 is a top of the line crimping tool when it comes to crimping Deutsch terminals. This world class tool offers precision crimps each and every time. With the ratchet style handle, this tool will never allow you to over or under crimp your connections. Watch and learn as the HDT-48-00 is put to action in our “how-to” video below.